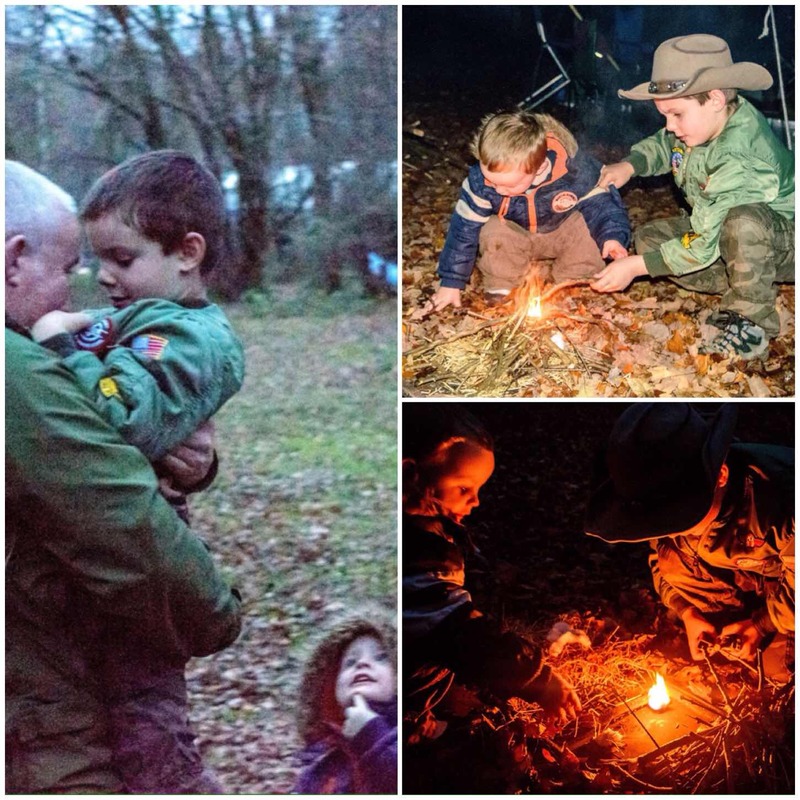 My last trip out for 2015 was a particularly nice one as we were celebrating the 6th birthday of a little bushcraft boy called David. 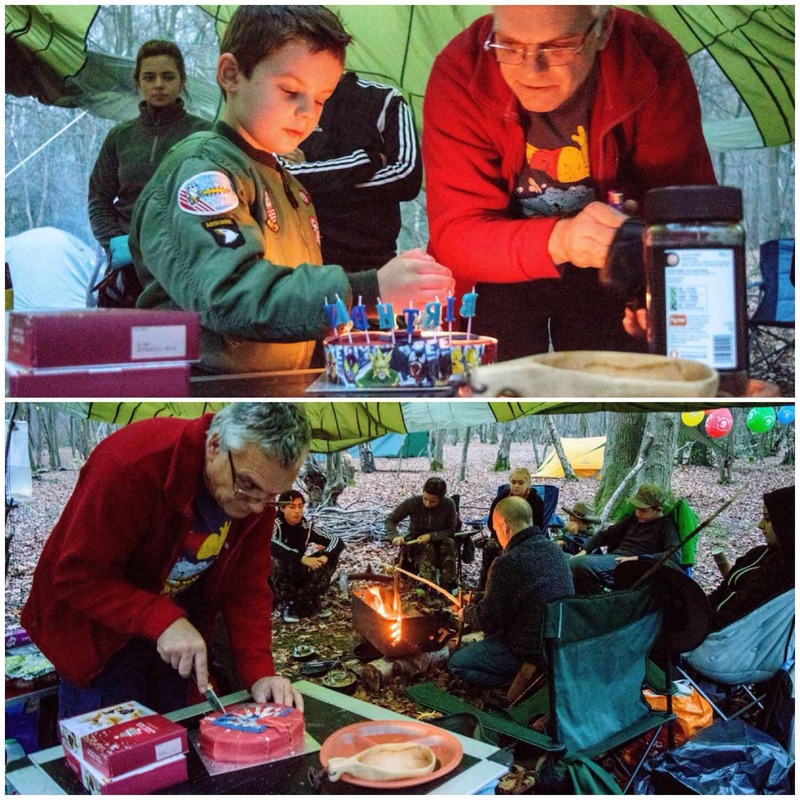 He loves the outdoors and his Grandfather Keith Coleman had organised to celebrate the event out in the woods at Danemead Scout camp. 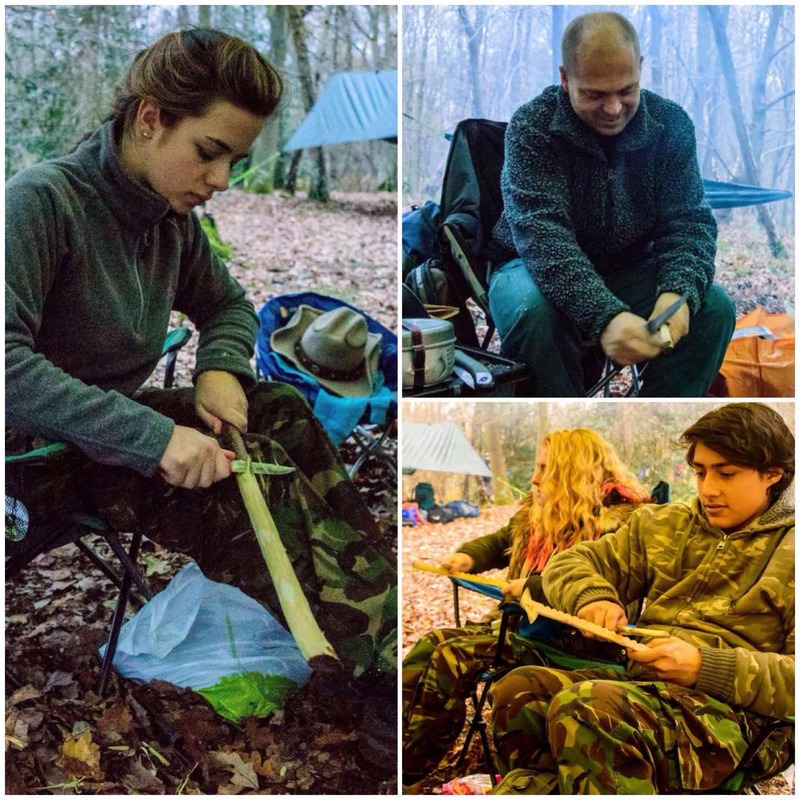 Keith was also out with a few of his cadets to practice some navigation skills and I was going to practice some bushcraft skills with my friends Dave, Alan and Jess. David’s Mum Maria was who is a good friend of mine was also at the campsite so it was great to catch up with her as we had not met up for a long time. Keith soon had the candles lit with David and we were soon tucking into a slice of Birthday cake. Later on the boys Dad Jim turned up with David’s little brother James. Jim has been a good friend of mine for many years so It was good to catch up on goings on again with him. While we were chatting the boys asked if they could light their own fire. 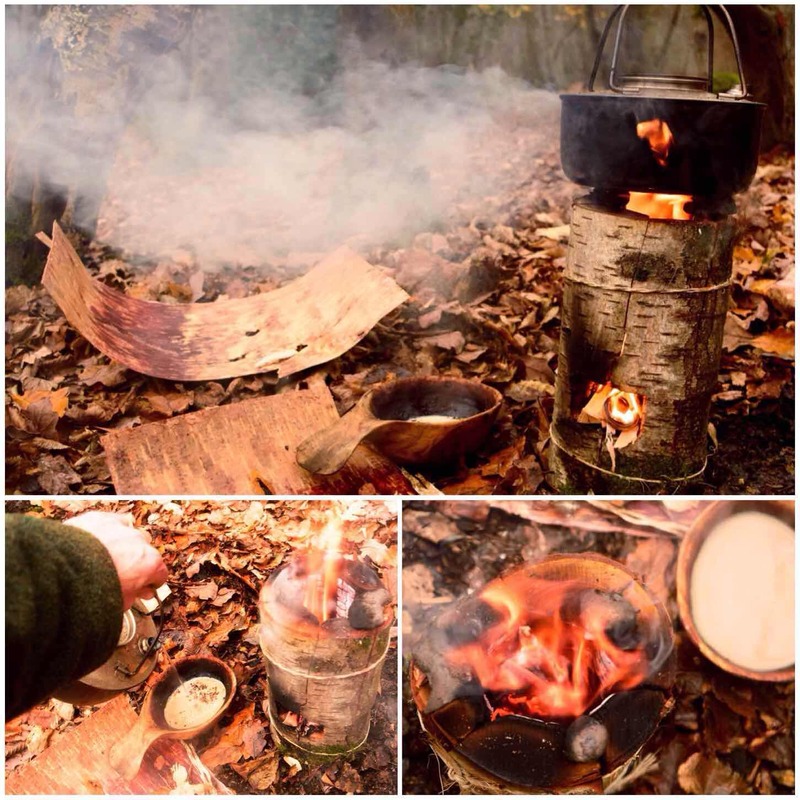 We spent a little while collecting some dry birch bark and small twigs and then got the Firesteels out. I also gave them some cotton wool and Vaseline to help get the fire going as everything was very damp. It was great to watch the two lads sparking away and then slowly building up their fire until it was well lit. Needless to say when it was time for them to go home they were very reluctant to leave their well nurtured fire. 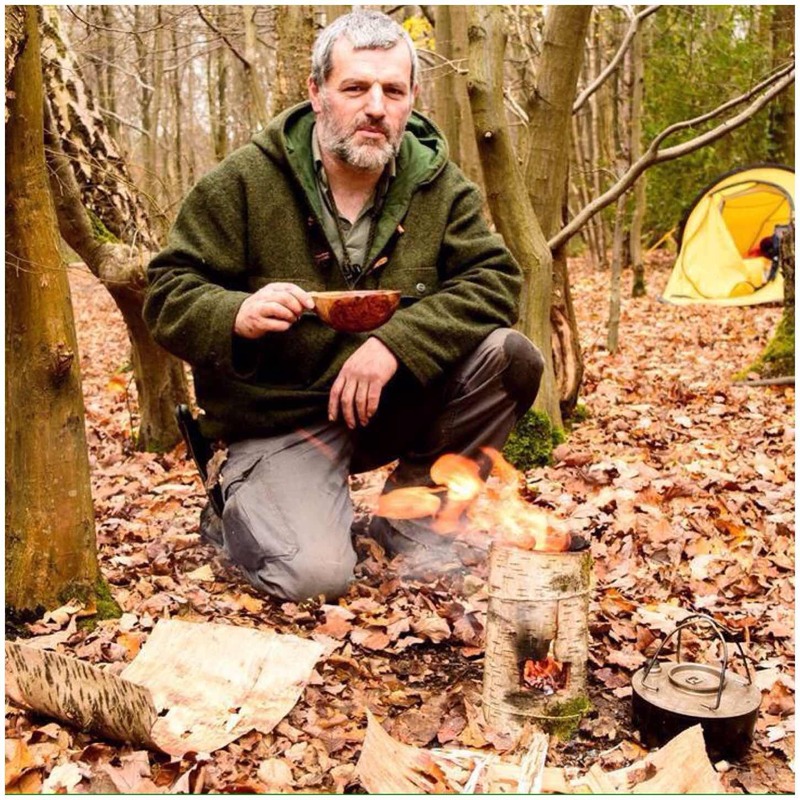 While the lads were busy making their fire Dave was busily building a spit to cook a joint of beef on. He stripped a green hazel sapling and put a split through the the middle of it with one end squared off. Then he carved a couple of flat skewers to go through the beef and the split. 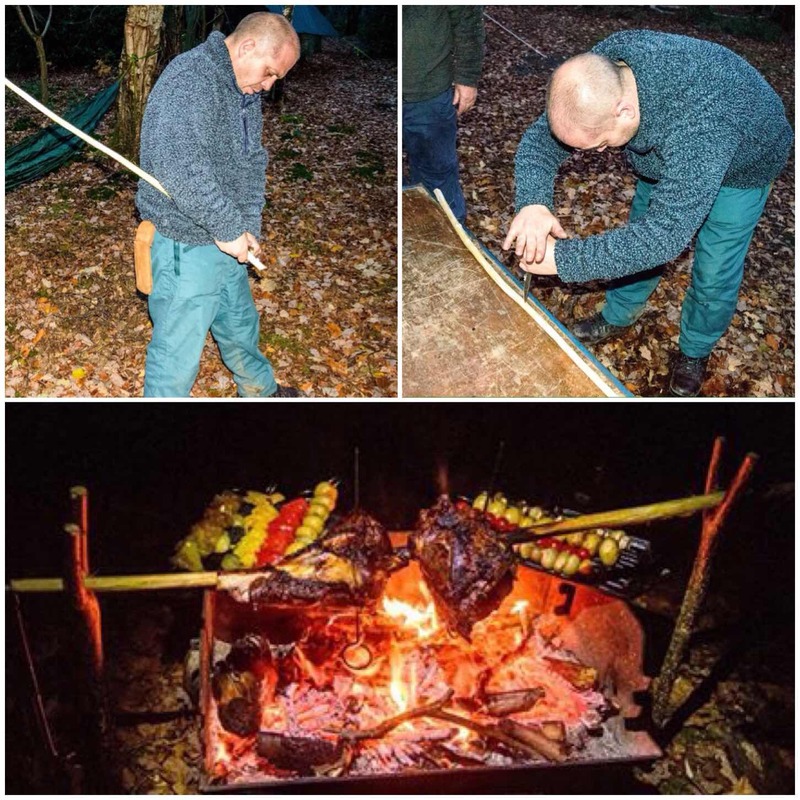 This method keeps the joint fixed to the hazel rod as it is turned over the fire. 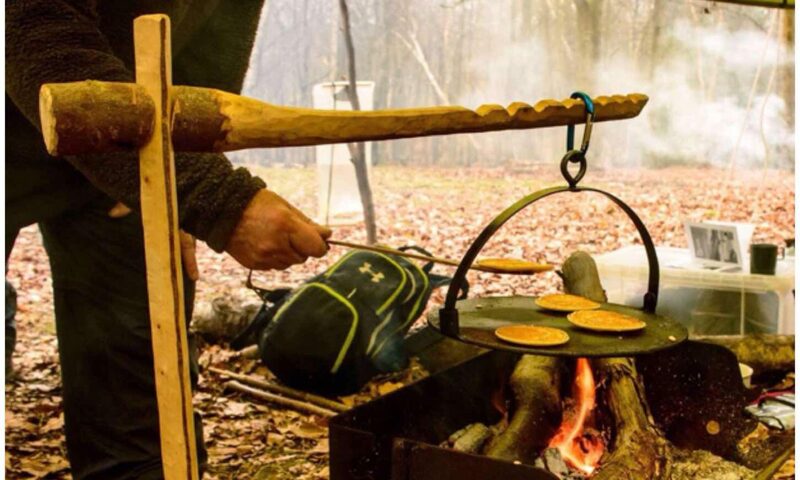 Once that was done he made two uprights to sit the hazel rod in over the fire. One of the uprights had a square notch carved into it for the squared end of the hazel rod to rest in. This ensured that as we turned the it it always remained fixed in the position we had set it. Dave’s father Alan is an excellent chef and he had been busily working away making up a whole range of different veggie kebabs. After a couple of hours turning the spit dinner was ready. As we try to be civilised 😉 at these events the cheese board was produced by Keith and a relaxing evening was had around the fire. 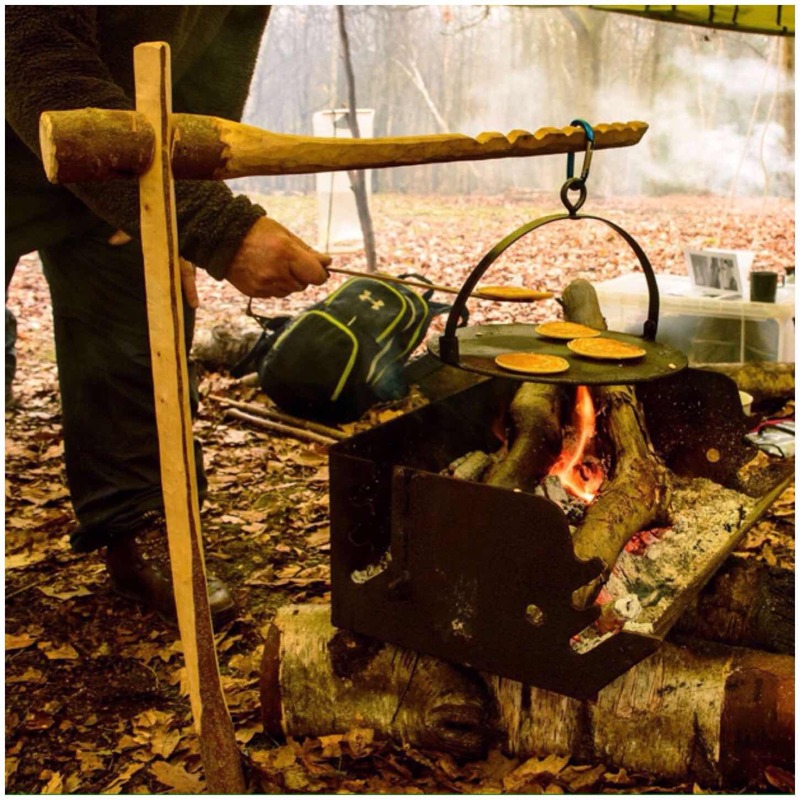 After a very restful sleep in my hammock I was awoke by our chef Alan busily working away around the fire preparing some pancakes for breakfast. Alan was using my griddle for this job (if you do not own one I would highly recommend that you invest in one) and it was hanging off my Dovetail Crane. This crane is made out of one piece of wood, is easy to make and offers you a wide range of cooking heights. While Keith was off doing some navigation work with his cadets I spent my morning constructing a Damp Wood Log Rocket Stove. These are easy to make and great to get a fire going in damp conditions. I must thank Jess for helping me at this stage to take a lot of my photographs as my hands were full with constructing the stove. Thankfully Jess is an excellent photographer so I did not need to worry if the right shot was being taken or not leaving me free to concentrate on the stove. All that was left after this was to have a brew and pack up for the trip home. 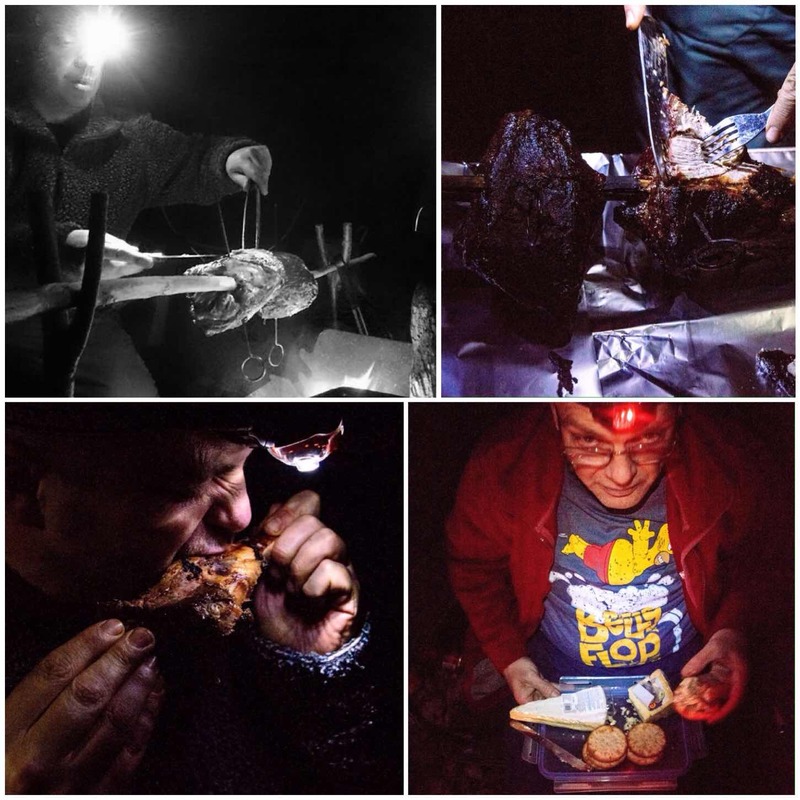 This was an excellent trip to round my year off amongst friends, eating well and celebrating the birthday of a budding bushcrafter.